There's something about wriggly puppy butts and cold, wet noses that are so endearing. Dogs are such naturally happy creatures, they just brighten the lives of those around them. As a dog owner, I can attest to the fact that there is almost no better feeling than coming home to your pooch who has missed you all day and then showers you with kisses and head bumps. It's such a tragedy that their lives are so much shorter than ours. These amazing creatures that have such a great impact on our lives are only here for a portion of our lives, but they leave footprints all over our hearts. Angie and Adam first met when they both worked at Petco, as fitting as that may be. Fast forward five years. Angie is now a dog groomer and photographer, and Adam works at a spice factory. What hasn't changed in that time is how much they love their little furball, Mika. Mika is jet black and just silky soft. Her ears definitely show off her personality as she prances around Angie and Adam's feet. She's a German Shepherd mix and was the runt of her litter. Angie and Adam took her in and have been loving her ever since. I mentioned the sorrow that comes with owning a dog, a feeling that Angie and Adam are very familiar with. They reached out to me to book a session because little Mika is sick. 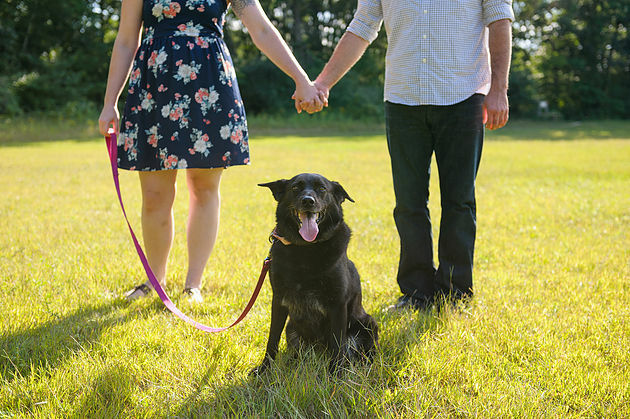 She has an inoperable tumor, and Angie and Adam wanted to have a special experience with her before it's time to say goodbye. On the outside, you wouldn't even know Mika is sick. She trots around like a puppy and has the tendencies of a much younger dog. She lifts the spirits of her owners even as "see you later" nears. I think it takes truly special people to not only love and care for an animal, but to be so conscious of it's well-being and recognize the incredible joy they've given them, and to know when they have to make a difficult decision. This session was a beautiful tribute to an even more beautiful dog. Mika, it's clear to me how much your mom and dad love you. I am so incredibly honored to have been able to meet you and your family and to have felt your wet nose on my cheek. I pray that you feel no pain, and that your family is able to heal after you've gone. You made their lives better with your spirit, and you left a paw print on my heart.